2016 will see two high-profile trade missions to Israel, one lead by NSW Premier Mike Baird and the other by Lucy Turnbull, wife of Australia’s Prime Minister Malcolm Turnbull. The missions are being organised by the Australia Israel Chamber of Commence and were announced at a Chamber lunch in Sydney by CEO Charles Nightingale. Introducing panel members Avi Hasson, Israel’s Chief Scientist, Wyatt Roy, Federal Assistant Minister for Innovation, Marita Chang founder of 2Mar Robotics and ANZ senior Managing Director Warwick Smith, the chairman of Optus Business Paul O’Sullivan said that both Prime Minister Malcolm Turnbull and NSW Premier Mike Baird had spoken about the importance of “re-inventing Australia” adding that as the mining boom finishes “we need to leverage our other skills to become a nation of entrepreneurs and innovators to capitalise on the massive markets around us”. Introducing Avi Hasson, O’Sullivan said Israel’s Chief Scientist had four key objectives….to assist in the development of technology to foster economic growth, to encourage Israeli technological innovation, to leverage Israel’s scientific knowledge and potential and to stimulate high value research and development within Israel and to collaborate internationally. Panel chair Warwick Smith was sent to Israel in 1985 by then Prime Minister John Howard to study the country’s technological advancement. Wyatt Roy told the 400 guests at Sydney’s Shangri-La Hotel that “the Prime Minister will make an innovation statement before Christmas” and that it “will be a complete game-changer for our country”. Roy said that 20,000 Australians are currently working in Silicon Valley and that in order to bring researchers to Australia to participate in local innovation we would “use our lifestyle to entice them from across the globe”. He said that we are not to be seen as a market of 23 million people but rather, given Australia’s strategic position, to be seen as market “of billions of people across the globe”. Wyatt Roy said: “Much like the Israelis, we always support the underdog and like to challenge the authoritarian mindset.” He said that Australia is not doing as well it should be with regard to the collaboration and commercialisation of its innovative research, adding that government should set an example by being innovative itself. Marita Chang, who founded Robogirls, an organisation which teaches schoolgirls about engineering robotics technology was Young Australian of the Year in 2012. She told the guests by video link of her experiences in China which currently is involved in collaborative projects with Israel. She stressed the importance of encouraging the young. Avi Hasson said it was “an exciting time” for Australia adding that there are more young people today “who want to be entrepreneurs and if you create the conditions for that to happen it will do so in a natural way.” He said that an ecosystem does not develop by itself and that the partnerships with private sector created by the Israeli government were “a pillar of our policies.” adding that government does have a role to play and that “your government gets it”. 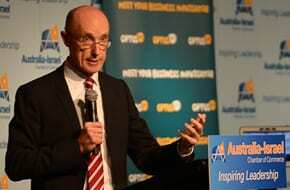 He said he was excited about putting a collaborative structure in place between Israel and Australia. “The world is changing dramatically. Don’t just see Asia as a target market. There is a rise in innovation in China, Singapore, Korea, Japan India and others”. Avi Hasson said that whereas many Israel companies had done massive business with U.S., Asia is now booming. Hasson said that Australia working with Israel companies would produce a “great bridge” between the nations. Wyatt Roy added that it was time for an ideas boom the replace the minerals boom. Avi Hasson was asked about Israelis who lived abroad and answered that Israel encouraged its citizens to travel and to study at the best institutions and to work for the best companies conceding that some did not return home. He went on to say that Israel co-operates with not only Israelis living abroad but with the world-wide Jewish community too. He said that Israel was a nation of immigrants…”people who had little to lose and were used to doing the impossible and taking risks”. Wyatt Roy said Australia shared Israel’s policy about its residents gleaning knowledge and experience overseas and coming home to put their new found knowledge to work in Australia adding that two years ago “we invested $200 million in the Melbourne Cup and only $100 million in innovation…but that is changing dramatically”. Charles Nightingale said that the two 2016 missions to Israel would be restricted to 30 participants each on a first-come first-served basis. This statement disqualifies the author’s views from any consideration whatever. is to take place. It is a direct slap in the face for the BDS movement and its academic and non academic members. We should not be perturbed by increased activity by this delusional group and others motivated by their anti Israel attitude.